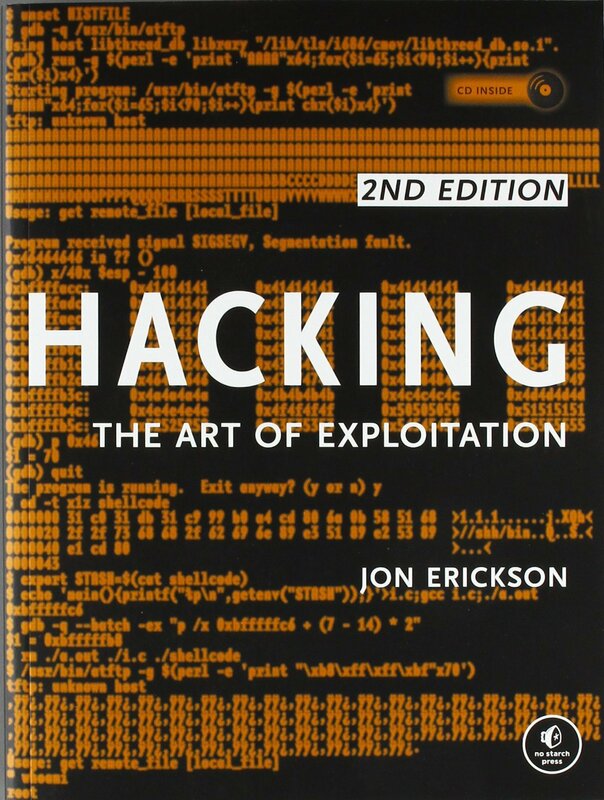 This is a review of the Hacking – the art of exploitation, 2-end edition book. Very short chapter (2 pages and 1/2) in which the author gives his definition of a hacker; person that find unusual solutions to any kind of problems, not only technical problems. The author also expresses very clearly the goal of his book: “The intent of this book is to teach you the true spirit of hacking. We will look at various hacking techniques, from the past to the present, dissecting them to learn how and why they work”. The chapter is an introduction to C programming language and to assembler for Intel 8086 processors. The entry level is very low, it starts by explaining the use of pseudo-code and then very gradually introduces many of the structures of the C language: variables, variables scopes, control structures, structs, functions, pointers (don’t expect to have a complete introduction to C or to find advanced material). The chapter contains a lot of code examples very clearly explained using the GDB debugger. Since all the examples are running under Linux, the last part of the chapter contains some basics about the programming on Linux operating system like file permissions, uid, guid, setuid. This chapter it builds on the knowledge learned in the previous one and it’s dedicated to the buffer overflow exploits. The most part of the chapter treats the stack-based buffer overflow in great detail using gradual complexity examples. Overflow vulnerabilities on other memory segments are also presented, overflows on the heap and on the BSS. The last part of the chapter is about format string exploits. Some of the string vulnerabilities use specific GNU C compiler structures (.dtors and .ctors). In almost all the examples, the author uses the GDB to explain the details of the vulnerabilities and of the exploits. One negative remark is that in some of the exploits the author use shell codes without explaining how these shell codes have been crafted (on the other side an entire chapter is devoted to shell codes). This chapter is dedicated to the network hacking(s) and can be split in 3 parts. The first part is rather theoretical, the ISO OSI model is presented and some of the layers (data-link layer, network layer and transport layer) are explained in more depth. The second part of the chapter is more practical; different network protocols are presented like ARP, ICMP, IP, TCP; the author explains the structure of the packets/datagrams for the protocols and the communication workflow between the hosts. On the programming side, the author makes a very good introduction to sockets in the C language. The third part of the chapter is devoted to the hacks and is build on the top of the first two parts. For the package sniffing hacks the author introduces the libpcap library and for the package injection hacks the author uses the libnet library (ARP cache poisoning, SYN flooding, TCP RST hijacking). Other networking hacks are presented like different port scanning techniques, denial of service and the exploitation of a buffer overflow over the network. In most of the hacks the authors it’s crafting his own tools but sometimes he uses tools like nemesis and nmap. This chapter is an introduction to the shellcode writing. In order to be injected in the target program the shelcode must be as compact as possible so the best suitable programing language for this task is the assembler language. The chapter starts with an introduction to the assembler language for the Linux platform and continues with an example of a “hello word” shellcode. The goal of the “hello word” shellcode is to present different techniques to make the shellcode memory position-independent. The rest of the chapter is dedicated to the shell-spawning(local) and port-binding (remote) shellcodes. In both cases the same presentation pattern is followed: the author starts with an example of the shellcode in C and then he translates and adapts (using GDB) the shellcode in assembler language. The chapter is about the countermeasures that an intruder should apply in order to cover his tracks and became as undetectable as possible but also the countermeasures that a victim should apply in order reduce or nullify the effect of an attack. The chapter is organized around the exploits of a very simple web server. The exploits proposed are increasingly complex and stealthier; from the “classical” port-biding shellcode that can be easily detected to more advanced camouflage techniques like forking the shellcode in order to keep the target program running, spoofing the logged IP address of the attacker or reusing an already open socket for the shellcode communication. In the last part of the chapter some defensive countermeasures are presented like non-executable stack and randomized stack space. For each of this hardening countermeasures some partial workarounds are explained. The last chapter treats the cryptology, an subject very hard to explain to a neophyte. The first part of the chapter contains information about the algorithmic complexity, the symmetric and asymmetric encryption algorithms; the author brilliantly demystifies the operation of the RSA algorithm. On the hacking side the author presents some attacks linked to the cryptography like the man-in-the-middle attack of an SSL connection (using the mitm-ssh tool and THC Fuzzy Fingerprint) and cracking of passwords generated by Linux crypt function (using dictionary attacks, brute-force attacks and rainbow tables attacks). The last part of the chapter is quite outdated in present day (the book was edited in 2008) and is dedicated to the wireless 802.11 b encryption and to the weaknesses of the WEP. As for the introduction chapter, this chapter is very short and as in the first chapter the authors repeats that the hacking it’s state of mind and the hackers are people with innovative spirits. The book it’s a very good introduction to different technical topics of IT security. Even if the author tried to make the text easy for non-technical peoples (the chapter about programming starts with an explanation about pseudo-codes) some programming experience is required (ideally C/C++) in order to get the best of this book.